Even fictional people have to eat. Sometimes food reveals what we should know about a character, sometimes it’s a pleasant pause in the action, and sometimes it’s got too many onions, but it’s still a very good sauce. Food Fiction is an ongoing feature that looks at some of the most memorable foods in the history of storytelling. Nothing illustrates how good a particular piece of food is like its power to cause betrayal, not just of comrades or family, but of civilization in general. That steak in The Matrix is one of the best looking pieces of food on film. Not because it’s shot so well or lit beautifully to bring out the texture. Not because it’s perfectly groomed by a food stylist or because the sound of cutting and chewing is turned up. That steak represents every basic worldly pleasure. Cypher chooses the expensive piece of meat over a life spent resisting the Matrix’s machine-dominated society. And the best part is, we all sort of get that. That scene’s effectiveness goes beyond our concerns for the people of the resistance. Every meat-eating viewer is fighting a little internal moral war, because we identify so completely with Cypher’s choice. After years of deprivation aboard a dingy old rebel ship, who wouldn’t love to clean up, relax, and eat a meal like that? 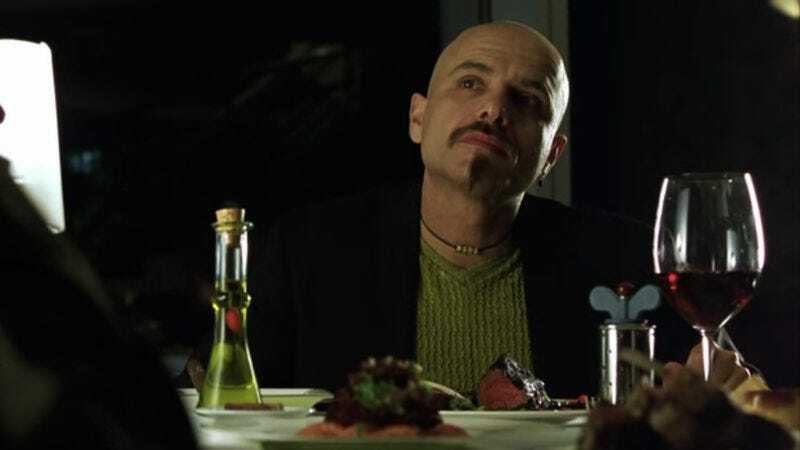 Even if we’ve suspended our disbelief and are bound to root for Morpheus and company, we all get why Joe Pantoliano’s traitorous jerk wants to give up, give in, and betray the cause. Just look at that steak, that wine, that linen tablecloth, and that cigar. Another major example of “food so good I’d forfeit all of what’s good in the world” happens in the first book of the Bible, then much later in a book that basically rewrites the main ideas of the New Testament as a fantasy for kids—The Lion, The Witch And The Wardrobe, in which Edmund Pevensie gives up his family and endangers The Cause Of Right almost as soon as he gets to Narnia and tastes the White Witch’s Turkish delights. Fortunately, Edmund eventually repents, puts the delights out of mind, and is metaphorically saved. But if there is a criticism of the Narnia books and the movies of them, it’s that they’re kind of stiff—and these Turkish delights might be an example of the sort of opportunity missed by the moviemakers to tap into our human desire; at no point are we made to really feel the draw of the Turkish delight. We see Edmund eating one rather messily, and presumably enjoying it, but we don’t “get” that seduction the way we understand Cypher’s motivations. All we know is the boy is mad for sweets, angry at his siblings, and easily influenced by Tilda Swinton. It’s the combination of forbidden food and a full accounting of its simple, basic indulgence that speaks to us the loudest. Food we’re not supposed to be eating, described or illustrated in sensual detail, communicates flavor to the audience. That’s what makes that steak in The Matrix so memorably attractive. In the context of the movie, it’s much more than a piece of cow. When I submit that steak as one of the best looking pieces of food on film, I’m aware of its competition. It’s not overall the best looking meal—that would be Big Night, or in some people’s (not everyone’s) opinions, Babette’s Feast. And there are plenty of other foods that look great—just recently we’ve had the Cubano sandwiches in Chef, any number of meals served by Hannibal, and pastries from Mendl’s so beautiful that a prison package-inspector can’t bear to cut into and destroy them in The Grand Budapest Hotel. The multiple perspectives on food and cooking in Tampopo are among cinema’s most compelling, and the various films about chocolate all mix very human emotions into their candy. But that steak holds its own and means so much. It doesn’t really exist, and yet it exists more than most foods, because it’s such a betrayal. Another scene that belongs on the best looking movie-dinner list is the prison meal in Goodfellas. The goombahs that Scorsese introduces us to didn’t betray society so that they could gain access to the food, like Cypher or Edmund, but still, in a sense, they’ve betrayed a lot of the conventions of basic civilization—they shouldn’t eat better than everybody else, inside or outside the walls of the pen. Yet they do. That thin-sliced garlic, liquefying in the pan with just a little oil, looks and sounds about as good as anything that’s going to be served anywhere in any restaurant in the world tonight—would it be that compelling if it were being prepared by just another chef, in just another kitchen? The fact that Paulie and the gang are not supposed to be eating that food makes it look like it tastes better than the food on even the best cooking shows. We know that the food they’re eating came at a cost—we know that they’re having such a lovely dinner and enjoying some camaraderie through threats, fear, and the general unfairness of a life where the mafia can live like kings in a facility meant to punish them, where everyone else lives like a pig. It’s as much the setting and the ethical compromises they made as it is the actual food—it’s the prison backdrop that makes that meal almost magical. More than mmmm’s of pleasure or exaggerated nods, more than close-ups of prep work and gorgeous side-lighting, the way to really convince a viewer that food tastes good is to create context—and if the context suggests the food is worth betraying mankind and basic human decency for, even better. Whether we like to admit it or not, we all get how good that kind of food would taste. Upcoming: I can’t! I can’t put a live thing in hot water!